Really, though, is there even such a thing as bad Italian? Even at its worst its still, like, mostly carbs and cheese and all kinds of bright, herby flavors. Yet, there are some places that take what’s inherently good and make it something else entirely. An Italian meal at its peak can be a transcendent experience—pure comfort wrapped in a cozy blanket of primo ingredients and a hearty smooch on both cheeks. This is the kind of food you don’t have to think too much about to enjoy. So just sit back, twirl a noodle or two, sip something big and red and earthy, and shut the heck up. This is dinner at its best. This unfussy Melrose spot is the rare neighborhood restaurant that puts out food way better than it needs to. Plus, they deliver pizza on Mopeds. Which is adorable. OK, so “Italian” is about more than just food—which here skews more red sauce than refined. The term also applies to a certain warm, welcoming spirit that this 60-year-old landmark nails. Where else can you order a fried steak smothered in cheese named for George Clooney? Chef Michael Fiorelli goes all California with his version of Italian in Manhattan Beach, serving a shaved black kale salad and housemade English muffins (!!!) alongside oven-roasted meatballs, bucatini with fennel sausage, and bubbly pizzas. Sydney Hunter III made a name for himself cooking practically perfect French food with Ludo Lefebvre. But before that he worked the stoves at some very respectable Italian joints. At his impeccably designed Silver Lake spot, he shows off his unshowy style of Italian. Solid, flavorful, and full of those great wood roasty flavors. Chef Antonia Lofaso is sort of the Italian mamma we all wish we had—in that she’s super fun and cool and was on Top Chef and also happens to make some seriously homey Italian food. It’s a mix of high and low, with eggplant parm and a meatball sub as well as gorgeous bucatini with burrata and dainty little squash blossoms stuffed with cheese. Chef Angelo Auriana led the kitchen at Valentino for more than a decade. Now, in the Arts District he works a menu of Northern Italian food that rivals anything in town. Ever had pasta in big torn sheets like a handkerchief, or stamped with designs to look like coins? No? Well then get thee to Factory Kitchen. Mauro Vincenti’s widow Maureen—whose laughter alone lights up the room, and who will kiss you on the cheek whether you like it or not—just spent some time remodeling Brentwood’s most loved Italian spot. Here, Nicola Mastronardi pairs just-cooked cuttlefish rings with bright green favas and drapes pizzas with slivers of porchetta. This is the place we most often sneak off to when we want to revel in spaghetti with bottarga, grilled meatballs and speckled guanciale pizzas. Steve Samson is dedicated to the cuisine of Italy’s south, which means no Parmesan, but seriously great Neapolitan pies. Though his four- decade-old cluster of dining rooms may not be the buzziest anymore, Piero Selvaggio’s flagship remains a centerpiece in the Italian scene here. The wine list alone has won a zillion awards, and the menu has been skewing Sicilian lately—a good thing. The same team behind Factory Kitchen is responsible for another Arts District Italian favorite, Oficine Brera. The food is Northern Italian style, which means more butter than olive oil, and some really, really good risotto. At the duo’s second Fairfax storefront, Jon Shook and Vinny Dotolo might have been going for a humble neighborhood Italian hang, but they made a destination restaurant. Blame those killer pizzas, mozzarella sticks, and cacio e pepe. Soft serve for dessert = all kinds of yes. How in the world does this place still require booking a reservation three months ahead? Is it really worth it? Yes, yes it is. If you’re skeptical, just try Ori Menashe’s chicken liver mousse, spaghetti with uni, chicken gizzards with beets, any pizza, chopped beef heart crostini, and really any of Genevieve Gergis’ incredible desserts. There now, see? Incredible. We’re really talking about the entire Mozzaplex, here, which includes both the infallible pizzeria and swanky restaurant of Nancy Silverton, Mario Batali, and Joe Bastianich. Heck, lets lump in Chi Spacca, the trio’s Italian meat lover’s fantasy. Gino Angelini has ruled the Italian scene on Beverly Boulevard since he opened this place in 2001. This is the kind of cooking that’s more about heart, less about trends. Sure, can you get truffles shaved on house-cured lardo that’s melted into artisan bread. But the lasagna verde is his most famous dish. So, there. Jersey-born Bruce Kalman has made Pasadena into an Italian food destination, which is saying something. He’s got a knack for big, bright, acidy flavors (he owns a pickle company, too), infuses pasta with different vegetables, and has been known to make a sorbet from fennel tops. Don’t worry your pretty little head about all that cheffy stuff, though. Focus your energy on finishing all that porchetta. Oh Zach Pollack, can you do no wrong? First you had us all loving the way you manhandled those speckled pizzas at Sotto. Then you opened this Silver Lake spot and showed us how serious Italian can also be sort of young and loud and fun. 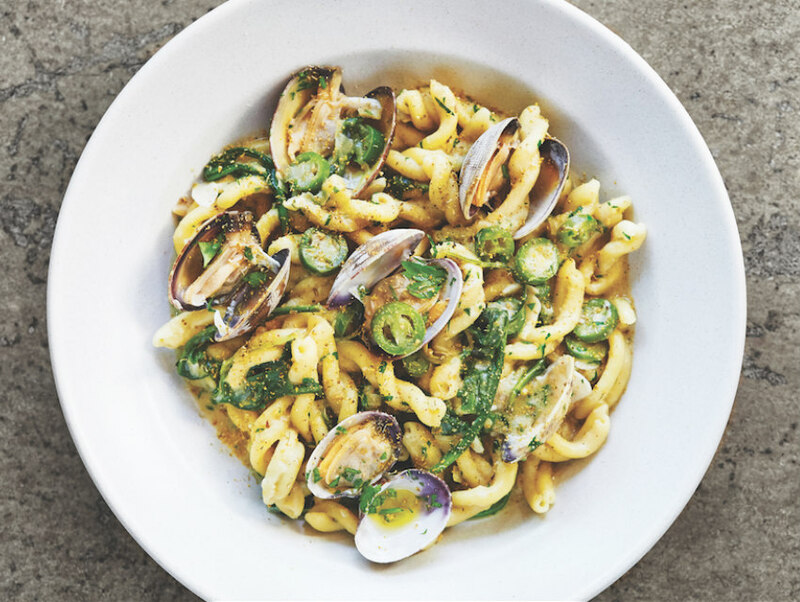 Alimento is the kind of spot where you can belly up to the bar for a glass of Gruner on tap and a plate of fusilli with clams, or you can gather with friends for tortellini en brodo and a prime ribeye with potato fonduta. So just stop it, OK? You’re making everyone else look bad. Previous articleThe 14 Best Places to BYOB in L.A.